Second concept: A chain and its liberties. 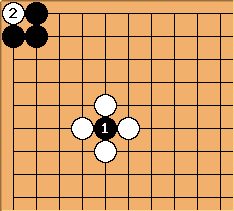 This is a first chapter in my ideas on go theory. To start from the stone counting rules: I currently strongly feel that that is how the game originated and it makes many concepts and principles very natural. To use English terminology and only replace it with a Japanese term if the latter is short and accurate (hane is a good example). English terminology is not subject to linguistic quibbles. More importantly, it forces to take a fresh look at principles and analyze why they would be true. Concepts formulated in a Western language probably transfer more easily to a Western mindframe, which is the mindframe for this article: working from the foundations to the roof, by logical reasoning, rather than moving about in the big house, by imitation and following proverbs. The project started with the investigation of a few proverbs that I thought were trustworthy. It has evolved away from the proverbs, into clear principles. I gradually felt that proverbs were not as much designed to give some kind of advice, but to summarize a situation. ("Cross-cut, extend"; "Hane at the head of two"; "Tiger's mouth"; "Corners then sides then centre"; are examples). So I started substituting proverbs with principles, which do carry advice, but on a more abstract level. The proverbs remain as abbreviations of concrete applications of the principles. 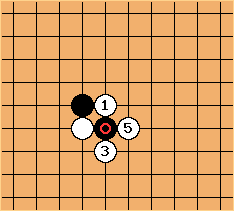 The chunk of edits on basic strategy, made in September-October 2005, were largely inspired by Minue's Haengma tutorial for beginners. Before that, another major influence has been Benjamin Teuber's essay on Stone Counting Teaching Method. Your comments on the discussion page are appreciated. The purpose of the game is to put more stones on the board than your opponent. 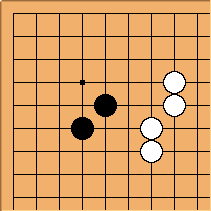 In this game end, Black has put down 11 stones on the board. White 10. To understand why empty points remain, one must know the rule of capture (see below). 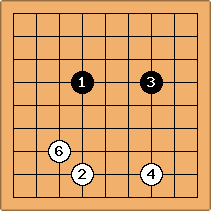 Rule: Stones are placed on the intersections of the board. Once placed, stones cannot be moved. They can only be removed. Rule: Players take turns. Black starts. A turn consists of either placing a stone or doing nothing, i.e. pass. Definition: A stone's liberties are its empty adjacent points. has four liberties. has three liberties. has two liberties. has three liberties, as has the unmarked black stone. Definition: A chain of stones is a set of stones of the same colour so that between each two stones there is a path of adjacent points occupied by stones of the same colour. Definition: The liberties of a chain are the union of the liberties of all stones that make up the chain. The two black stones on the left form a chain with 6 liberties. The white stones are also a chain with 6 liberties (because the marked stone takes a liberty from the original 7). 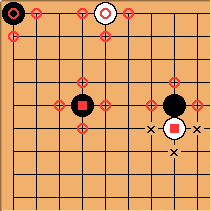 The two black stones do not form a chain. You could say there are two chains of one stone each. The white stones form two chains of two stones. 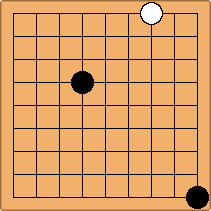 Rule: after playing a stone, the opponent stones without liberties are taken off the board. After , the marked black stone is captured. The state after , where the marked stone has only one liberty left, is called atari. 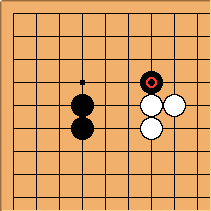 A note on suicide: after applying the rule of capture, if the played stone belongs to a chain with no liberties, this chain is taken off the board. Alternatively, such a play is forbidden. The move is useless, because the stone remains without liberties, and is made illegal in the rules that most people apply. The same goes for . However, after , the three white stones have no liberty and are removed, after which has liberties. Idem for : the marked stones are removed and has liberties. In some situations, board positions can be infinitely repeated. The ko rule forbids this. 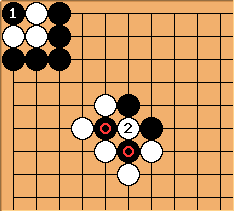 However, the game principles dealing with ko are advanced and do not affect the basic ideas of Go.